Multi-epitope peptide-specific antibody production. BALB/c mice (n = 9/group) immunized either with individual peptide emulsified in CFA/IFA or PBS alone, were bled 15 days post third immunization and sera were separated. (A,B) total IgG Abs, and (C) IgG1 and IgG2a Abs against each peptide were assessed by ELISA. The results are expressed as OD450 ± SD. 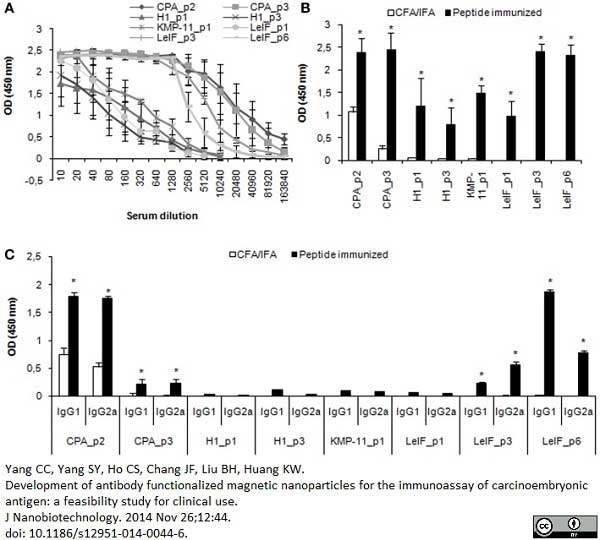 Significant differences between groups of mice immunized with each synthetic peptide emulsified in CFA/IFA and the group of mice immunized with CFA/IFA alone are indicated by * (P < 0.05). From: Agallou M, Athanasiou E, Koutsoni O, Dotsika E, Karagouni E. Experimental Validation of Multi-Epitope Peptides Including Promising MHC Class I- and II-Restricted Epitopes of Four Known Leishmania infantum Proteins. Front Immunol. 2014 Jun 10;5:268. Biotin labeled Rat anti Mouse IgG1 Heavy Chain antibody, clone LO-MG1-2 (MCA336B) used for antibody class evaluation by ELISA. Anti-IGF1R and anti-HER2/neu antibodies elicited by cell vaccines co-targeting HER2/neu and IGF1R. Analysis of antibody isotypes induced by cell vaccines as in Figure 3A (n = 3 mice per group). From: De Giovanni C, Landuzzi L, Palladini A, Ianzano ML, Nicoletti G, Ruzzi F, Amici A, Croci S, Nanni P, Lollini PL. Cancer Vaccines Co-Targeting HER2/Neu and IGF1R. Cancers (Basel). 2019 Apr 11;11(4). pii: E517. Rat anti Mouse IgG1 Heavy Chain antibody, clone LO-MG1-2 recognizes murine IgG1, and does not bind other mouse immunoglobulin classes or subclasses. Spleen cells from immunised LOU/c rats were fused with cells of the rat IR983F myeloma cell line. Where this antibody has not been tested for use in a particular technique this does not necessarily exclude its use in such procedures. Suggested working dilutions are given as a guide only. It is recommended that the user titrates the antibody for use in their own system using appropritae negative/positive controls. Where this antibody has not been tested for use in a particular technique this does not necessarily exclude its use in such procedures. Suggested working dilutions are given as a guide only. It is recommended that the user titrates the antibody for use in their own system using approriate negative/positive controls. This product may be used in a direct ELISA or as a detection reagent in a sandwich ELISA together with MCA1289 as the capture reagent. Song, J. et al. (2000) Heterogeneous distribution of isoactins in cultured vascular smooth muscle cells does not reflect segregation of contractile and cytoskeletal domains. J Histochem Cytochem. 48 (11): 1441-52. Denis, O. et al. (1993) Resting B cells can act as antigen presenting cells in vivo and induce antibody responses. Int Immunol. 5 (1): 71-8. Nakanishi, S. et al. (2010) Sequence analysis of a bacteriocinogenic plasmid of Clostridium butyricum and expression of the bacteriocin gene in Escherichia coli. Echeverria, P.C. et al. (2006) Potent antigen-specific immunity to Toxoplasma gondii in adjuvant-free vaccination system using Rop2-Leishmania infantum Hsp83 fusion protein. Huang, C.H. et al. (2011) Airway inflammation and IgE production induced by dust mite allergen-specific memory/effector Th2 cell line can be effectively attenuated by IL-35. Agallou, M. et al. (2014) Experimental Validation of Multi-Epitope Peptides Including Promising MHC Class I- and II-Restricted Epitopes of Four Known Leishmania infantum Proteins. Doerfler, P.A. et al. (2015) BAFF Blockade Prevents Anti-Drug Antibody Formation in a Mouse Model of Pompe Disease. Phil Sci Lett. 2(1): 38-48. Blackwell, N.M. & Else, K.J. (2002) A comparison of local and peripheral parasite-specific antibody production in different strains of mice infected with Trichuris muris. Parasite Immunol. 24 (4): 203-11. Hall, G. et al. (2003) Suppression of allergen reactive Th2 mediated responses and pulmonary eosinophilia by intranasal administration of an immunodominant peptide is linked to IL-10 production. Hjerpe, C. et al. (2010) Dendritic cells pulsed with malondialdehyde modified low density lipoprotein aggravate atherosclerosis in Apoe(-/-) mice. Kretschmer, B. et al. (2015) Anti-CD83 promotes IgG1 isotype switch in marginal zone B cells in response to TI-2 antigen. Doerfler, P.A. et al. (2016) Copackaged AAV9 Vectors Promote Simultaneous Immune Tolerance and Phenotypic Correction of Pompe Disease. Hum Gene Ther. 27 (1): 43-59. Kato, G. et al. (2014) β2 adrenergic agonist attenuates house dust mite-induced allergic airway inflammation through dendritic cells. Margaroni, M. et al. (2017) Vaccination with poly(D,L-lactide-co-glycolide) nanoparticles loaded with soluble Leishmania antigens and modified with a TNFα-mimicking peptide or monophosphoryl lipid A confers protection against experimental visceral leishmaniasis. Int J Nanomedicine. 12: 6169-84. DeGiovanni, C. et al. 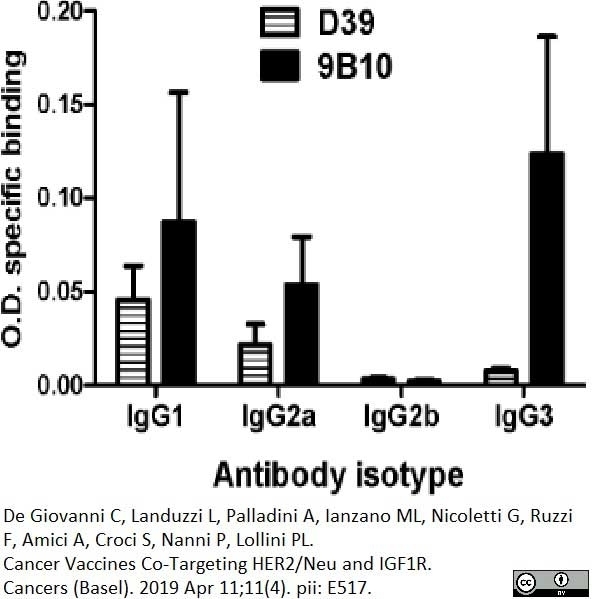 (2019) Cancer Vaccines Co-Targeting HER2/Neu and IGF1R. Cancers (Basel). 11 (4) Apr 11 [Epub ahead of print].